The 8th edition of the Best of the Best in films and TV programmes(BOBTV) begins today at the Ladi Kwali Conference Centre, Sheraton Hotel & Towers, Abuja. Nollywood icon Amaka Igwe is the brain behind this important fiesta of movies and TV programmes. The 8th BOBTV is attracting visitors and participants from within Nigeria, Ghana, Canada, Zimbabwe, Namibia, England, United States, South Africa and other countries. See the details in the following press release on the event that will end on Thursday march 17, 2011. The organisers of BOBTV, Africa’s premiere film and television programmes expo, have released the list of “Best of the Best” honours for 2011. The list includes chairman of the Silverbird group, Ben Murray Bruce, nollywood movie marketer Ossy Affason, copyright lawyer Efere Ozakor and Make-up and special effects virtuoso Dagogo Diminas. Acknowledging hardworking professionals who have contributed to the growth of the movie and television industry in Nigeria has always been an integral part of BOBTV. 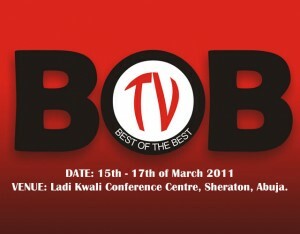 The recipients will be showcased and celebrated at the 8th African Film and TV Programmes Market, BOBTV 2011, scheduled to hold from the 15th to the 17th of March at the Ladi Kwali Conference Centre, Sheraton Hotel and Towers, Abuja. Ben Murray Bruce, Director of the Silverbird group, owners of the Most Beautiful Girl in Nigeria franchise, Silverbird Television and Rhythm 93.7 radio stations, was chosen in recognition of his mammoth contribution to the entertainment industry in Nigeria. Ossy Affason’s immense contributions to Nigeria’s movie market can’t be understated. The renowned movie marketer and distributor of Nollywood movies has been chosen for his pioneering contribution to movie marketing in Nollywood. Entertainment lawyer Efere Ozakor, who took a different approach to entertainment law in Nigeria was chosen for his outstanding contribution to the provision of legal framework for the Nigerian broadcast and entertainment industry. Dagogo Diminas, make-up and special effects pioneer, with over two decades of experience has been chosen for his pioneering excellence in special effects in Nollywood. This year’s recipients join the prestigious “Best of the Best” honours list that includes Dr. Raymond Dokpesi, Chief Peter Igho, Ms. Liz Benson, Mr. Andy Amenechi, Sam Loco Efe, Chika Onu, Dr. Umar Farouk Jibril, Antar Olaniyan and Engr. Tony Ikoku. Mr. Lekan Ogunbamwo, Mr. Sam Dede, Bukky Ajayi, amongst others.